LEXINGTON, Ky. (Dec. 6, 2018) — Last year, as part of their studies in the Human Development Institute’s (HDI) Universal Design Certificate Program, two undergraduate students, Lauren Brown and Kennedy Guess, wrote and received an Inclusive Excellence Student Program Grant for $9,975. The Inclusive Excellence funds were awarded to HDI in September to host a Still We Rise banquet that will recognize the strengths and resilience of students who have overcome extreme circumstances. Along with the institute, partners on the Still We Rise banquet include the UK Disability Resource Center, Student Support Services and the Martin Luther King Center. Kennedy Guess, a senior in the communications and sciences disorders program and an HDI universal design certificate student, is spearheading the grant effort. Honoring the resiliency of fellow UK students is particularly important to Guess as she herself has experienced and overcome obstacles in her journey, including depression. “On the outside my life looked perfect. I had great grades. But, no one saw how hard it was for me to get out of bed every day. 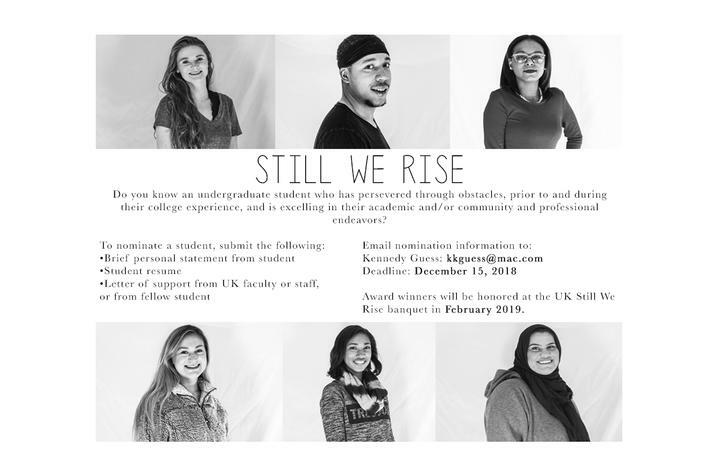 Students selected for awards will be honored at the Still We Rise banquet on Feb. 21, 2019, at the Gatton Student Center. Nominations are now open for the Still We Rise 2019 award. To nominate a student, submit a brief personal statement from the student, student resume, and a letter of support from UK faculty/staff or from a fellow student. Deadline to nominate is Dec. 15, 2018. All materials can be submitted electronically to Kennedy Guess at kkguess@mac.com.